Installment #2. 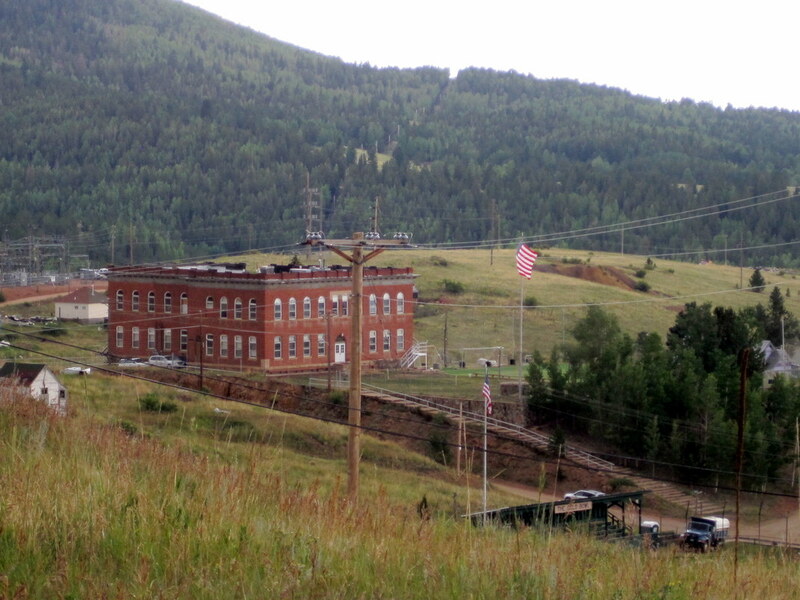 SEVEN GENERATIONS IN VICTOR, COLORADO AND THE MINING DISTRICT--The Way It Was. Installment #2 submitted (February 2018) by Tish Allen--daughter of Eleanor Musser Baker, granddaughter of Sadie Musser. ​​There was a legend about the Isabella Mine and a Swede who was leasing there on the 3rd level. He had good ore and he put in a full shift every day. But he nearly froze every day also. It was impossible for him to work hard enough to keep warm in the draft and if he wore more clothes he wouldn’t be able to squeeze into his tight little stope. The vein was only about two feet wide. The upper levels of the Isabella shaft on the north slope of Bull Cliff were cold as icebergs. The reason for this was a tunnel that connected with the shaft. The cold air came in through the tunnel and then up the shaft. The shaft was always damp because of the warm, moist air coming up from the lower levels. They had a door to close off the draft but it had been frozen open for years and nobody bothered to dig it out. Every evening at quitting time, this Swede would climb down out of his stope shivering and shaking, his teeth chattering and his face and hands blue as his eyes. He would be seen in Victor of nights, still shivering and shaking from the cold. The food would even shake off his knife when he was eating, and he had to hold the whiskey glass with both hands to keep from slopping his drink on the floor. Whiskey was the only thing that warmed him, he said. He called it his “Anti-freeze” and he got to drinking all his meals. Then he started having nightmares about the mine and he’d wake up shivering and hoist another shot. One morning he was found dead in his room at the Baltimore Hotel in Victor. He was not only dead; he had frozen to death in a steam heated room. 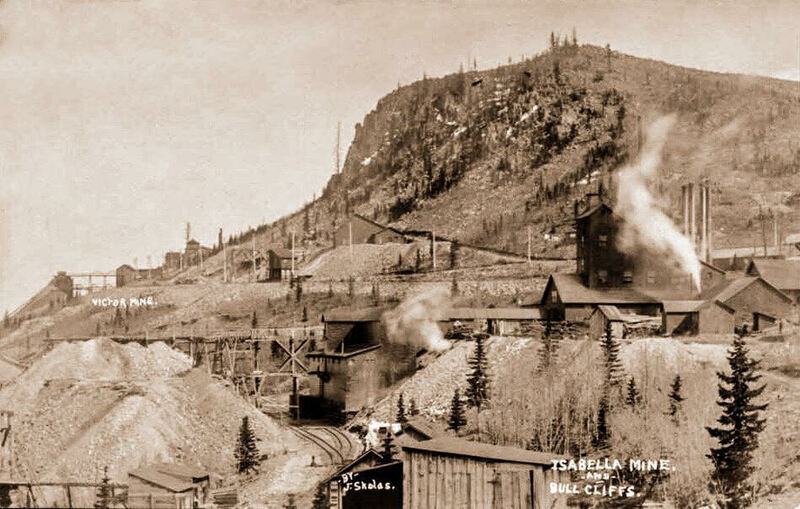 The Isabella Mine (right foreground) was located near Bull Cliffs. Sadie Musser and Eleanor Baker remembered the legend about a Swedish miner who leased on the 3rd level of the Isabella Mine and died at the Baltimore Hotel (which was located on N 3rd St next to the Monarch Block). Historical photo by Julia Skolas. 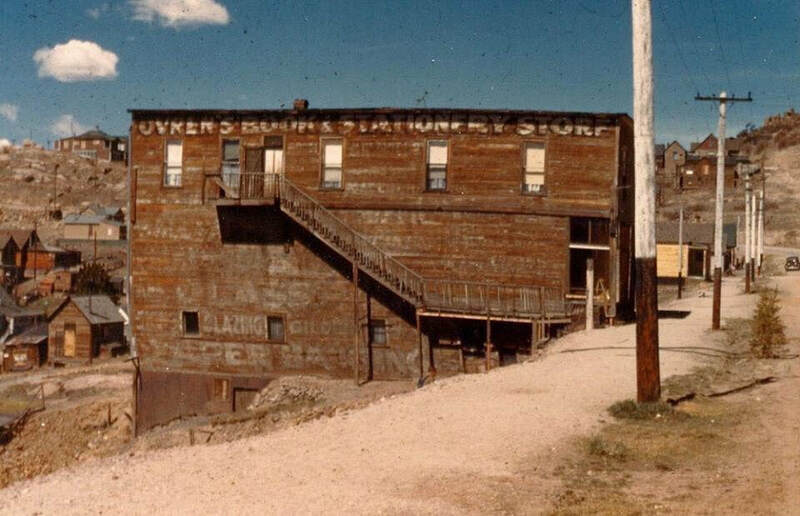 The Baltimore Hotel was the largest hotel in Victor in 1911. It was three stories high and had 50 large rooms for rent. After the hotel was torn down, Sadie Musser's Gold Belt Cafe was located here during the 1930s & 1940s in a one-story building (see photo in Installment #1). ​Twelve to fifteen trains operating on three different railroad lines came to Victor from Florence and Colorado Springs each day. 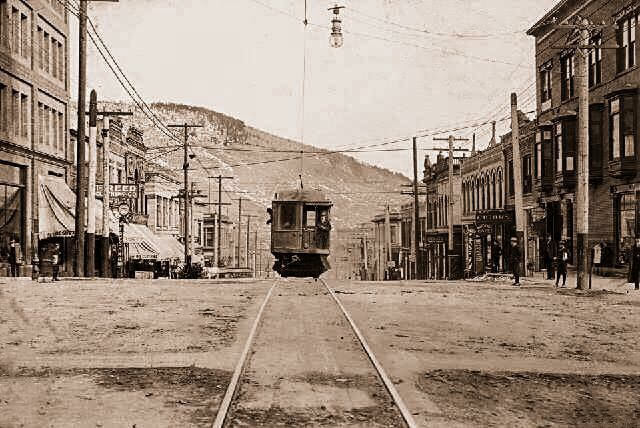 There were also two street car lines, the Hi Line and Low Line, operated by two different companies and they ran 24 hours a day between Cripple Creek and Victor. The mail came in by the railroad in the early years, but later it was trucked in. The Altman Post office closed February 1, 1908 after 12 years service. Postmaster H.T. Coppage resigned. After some discussion the office was moved to Midway and Mrs. Edith Doyle took the Postmaster position. Trolley headed east on Victor Ave. Two trolley lines served Victor & the Gold Camp--miners could ride to work for a nickle. A.J. Harlan historical photo. 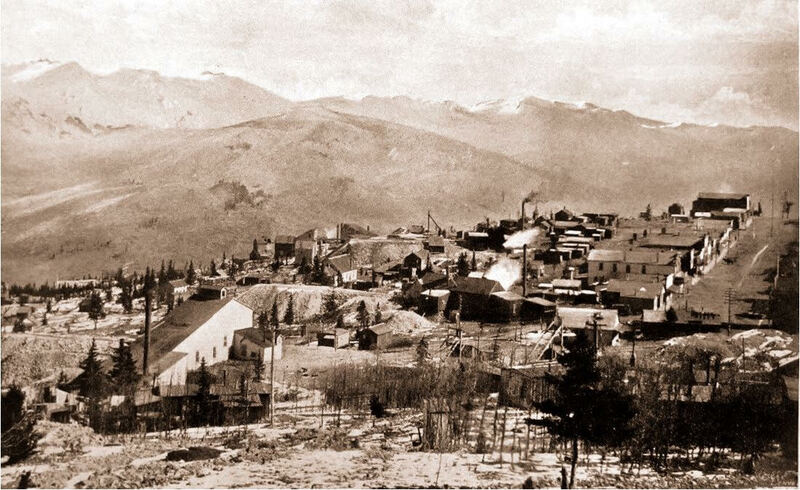 At an elevation of 11,150 feet, Altman was known as highest incorporated city in the world and it was on the Gold Belt Line. The town and the town site no longer exist. 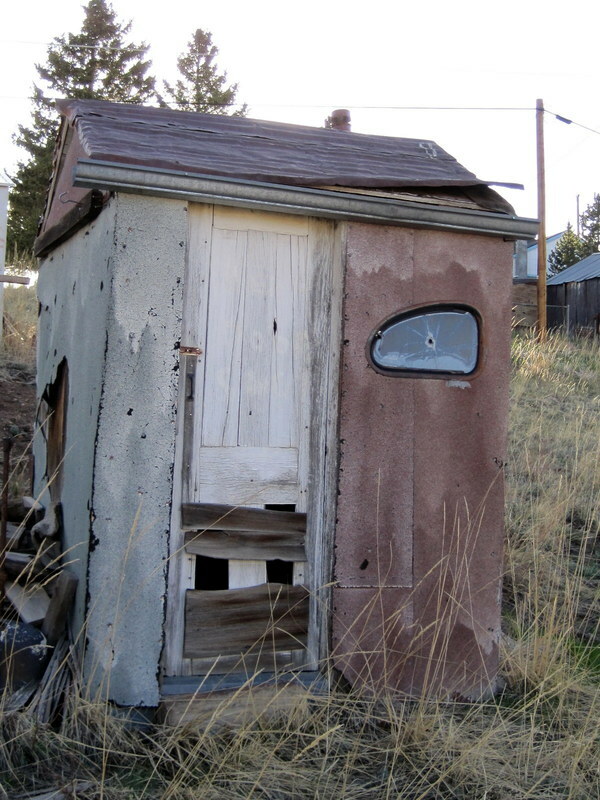 Kids today might be hard pressed to find an Outhouse in Victor. But there is at least one survivor that is in good repair – with electric heat and lights, as well as a “high tech” environmentally approved “waste disposal system”. THIS VINTAGE VICTOR OUTHOUSE IS NOT IT. Everyone had an Outhouse and at Halloween kids would move them to the middle of Victor Avenue just to get a rise out of the police. Three large wolves came down from Bull Cliffs and came within fifteen feet of the Roscoe cottage owned by the Roscoe Leasing Company. One wolf was killed and it weighed 72 pounds. The Lincoln School on South 3rd Street in Victor was dedicated April 9, 1901 [photo below]. Supt. Palmer urged the cooperation of the parents to help make the schools better. It was announced that the famous Red Light dance hall on North 2nd Street will be used by Barnes Machinery and Tool Company with E. A. Barnes owner. It was to become a first class machine shop. In August 1918 Emma Hopkins announced the old Red-light District Houses located east of the Ball Park and close to the Victor High School will be torn down. The buildings were purchased by the firm of Pennington and Harris, together with their contents, with the understanding that the structures be torn down and the ground cleared. There were nearly a dozen buildings in Iniquity Row. Lincoln School (foreground, center) is the large two-story building at the end of S 3rd Street. Only remnants of the school foundation can be found there today. Historical photo by Bill Lehr provided by LaJean Greeson. Click to enlarge. 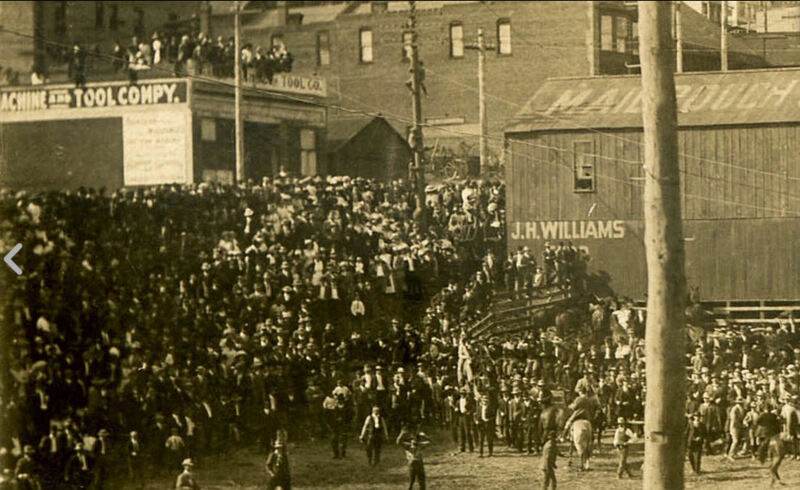 Behind the crowd watching the Bronc Busting Rodeo is the "Barnes Machinery & Tool Company" sign -- most likely on the building formerly occupied by the Red Light Dance Hall. Click photos to enlarge. 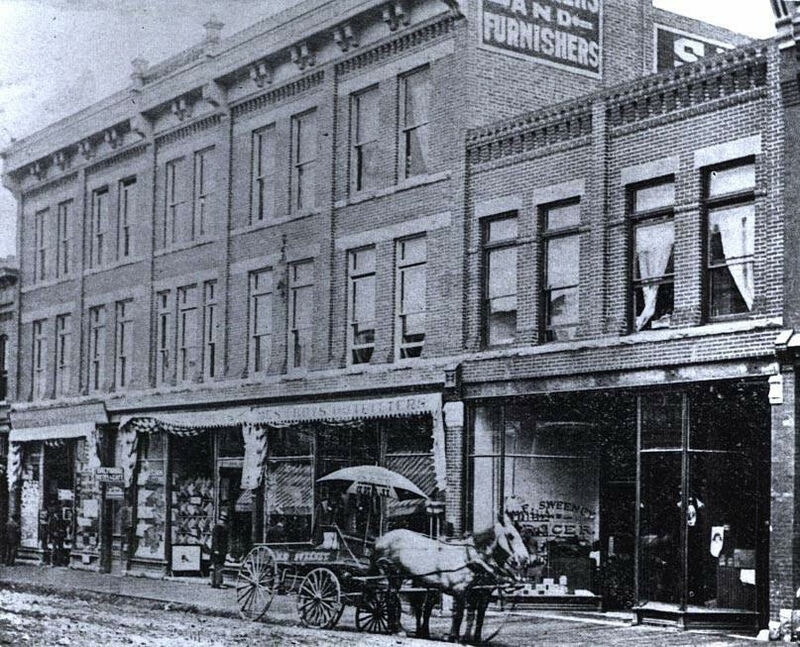 Today's four-story Victor Hotel was built by the Woods Investment Company to replace their original bank building (at this location) and their original hotel building (which was across the street where Jet Service is now located) since both were destroyed in the Great Fire of August 21, 1899. The Emergency Hospital was located on the 4th floor of the building for a short time. After the Woods Bank was declared insolvent in 1903 the building was occupied by successor banks and an assortment of businesses. The restored building is listed on the National Register of Historic Places. Lehr photo from 1930 provided by LaJean Greeson. F&CC Railroad conductor, James Brown, noticed a distressed mountain sheep hanging by its horns and caught in the wire, which saved the animal from certain death (February 10, 1907). Today the WPA installed stairs & retaining wall around the Victor High School serve the High Elevation Training Center & Rocky Mountain Soccer Camp. ​​On May 8, 1915 the Grand Army of the Republic announced the remains of the departed members will be removed to Sunnyside cemetery (from the GAR cemetery) to a plot secured by members of the Women’s Relief Corps. The old dance hall building on the corner of North 2nd Street and Diamond Avenue partially collapsed. No attempt was made to repair the structure (June 6, 1915). The Gold Bowl caved in on the southeast side, because of old mine workings underneath, and so did the playground at the school. 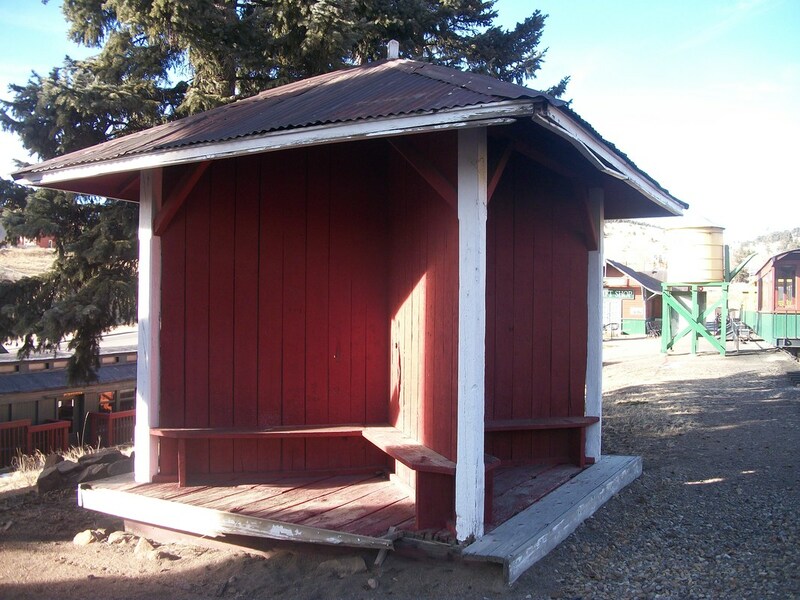 Waiting Station moved from Pinnacle Park to Cripple Creek. Photo complements of Shirley Beach. There was a golf course North and South of the Phantom Canyon Road and the road ran further North near the south edge of Goldfield before they opened it across the old Mill Tailings. 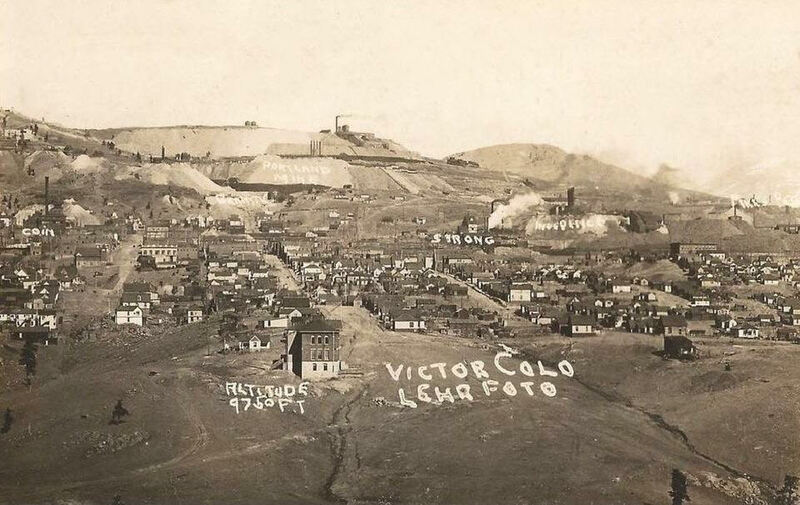 There was a process mill on the East side of Victor, below Goldfield. A stream of water flowed from it and in the summer the kids would make wooden stick boats and race them down the Cyanide trestle and tracks. The kids used to have baseball games on the Cyanide Dump near the Canyon Road. Victor Avenue Looking West--Gravel Gold Bowl Ball Field (right foreground). Original 1950's photo by Emma Peters (colorized in 2018 by Tim Wager and contributed by Emma Peter's granddaughter, LaJean Greeson). 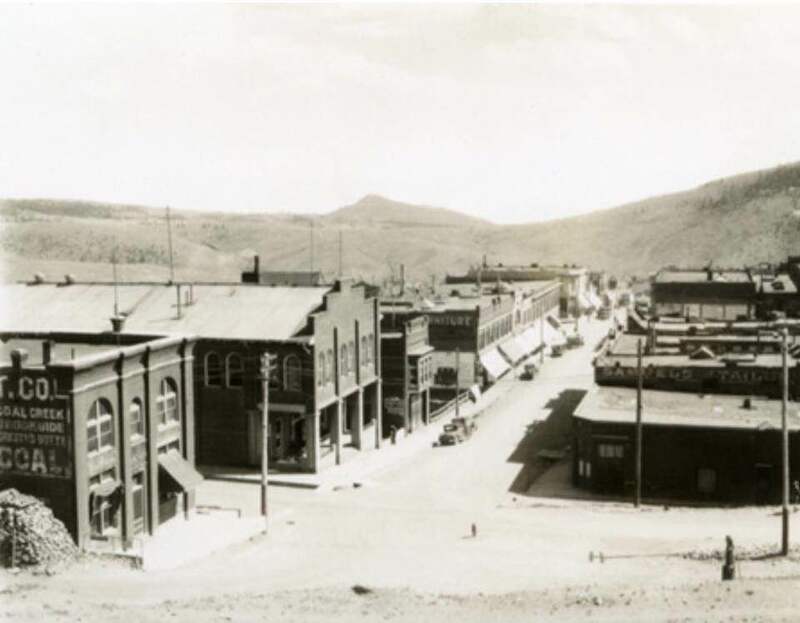 Cripple Creek had the only stop light in Teller County. The Trading and Transfer weighed the coal trucks on a scale on Diamond Avenue across from the Elks. 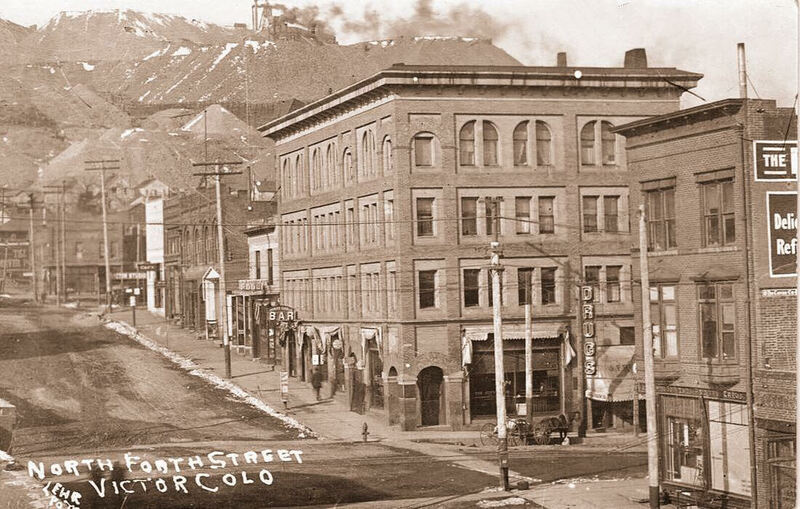 Brick portion of the Colorado Trade & Transfer (far left) was originally a two-story building. Historical photo from the "Lowell Thomas Collection" provided by LaJean Greeson. 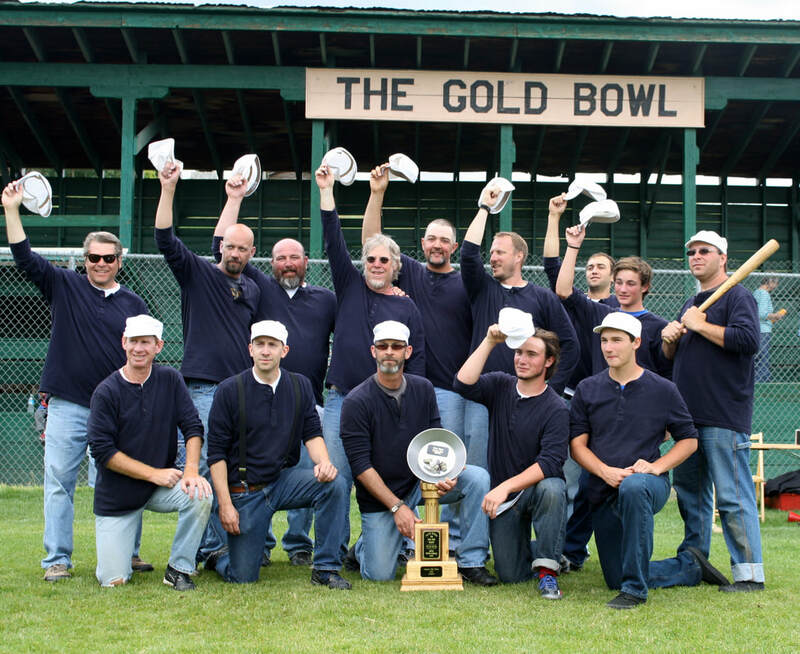 Victor Miners Team won the 2015 Vintage Baseball Tournament Championship in the Gold Bowl now refurbished with beautiful turf. Photo provided by Jon Zalewski. Ovren's Book & Stationary Store was located on Victor Avenue across from City Hall. At one time there was a wooden sidewalk in front of buildings on this side of the street. Photo courtesy of Jim Davidson. 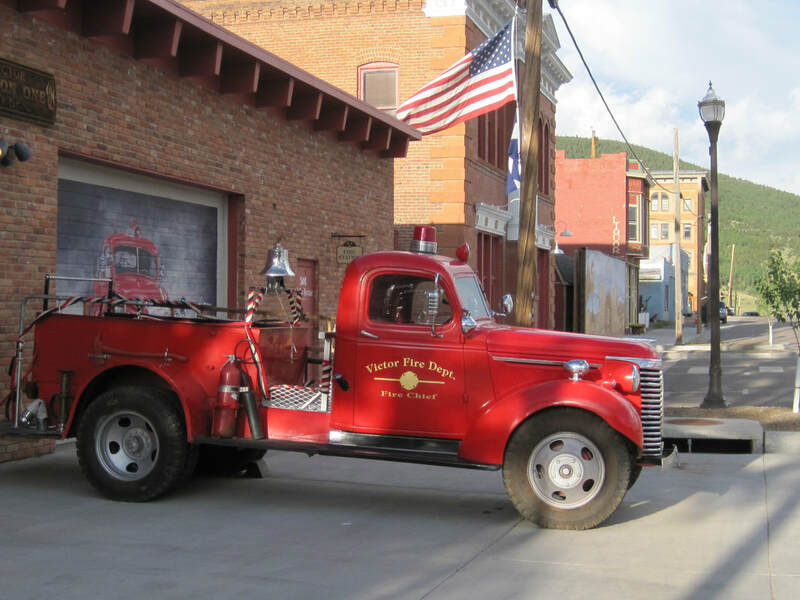 Rudy Balke donated money to construct Victor's Emergency Services Building (left, next to City Hall), and also established a Trust Fund that continues to benefit Victor residents. 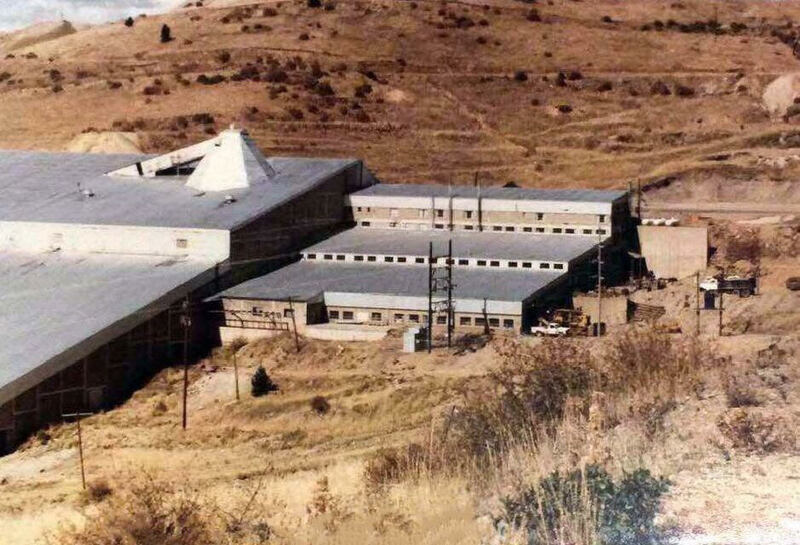 Carlton Mill, 1983 photo taken by Arthur Coltrin & contributed by LaJean Greeson. There was a gas and supply station across from the Carlton Mill on Hwy 67. 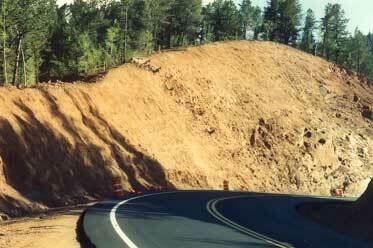 The road to Colorado Springs was dirt all the way and came up through the old 4-mile road. People would have to back up the switch backs in winter when it was slick. Roads weren’t plowed as much then and very few had 4-wheel drives. They put in an airport at Gillette and a plane was housed in the old wooden hanger. When a local boy crashed his plane on a visit they quit using it because of the wind gusts causing problems. You would pick up the telephone and tell the operator who you wanted to talk to if you didn’t remember the telephone number. Sometimes four or five different houses would pick up the party line and visit in on the conversation. You only went through Woodland Park on the highway if you only needed gas or medicine. They opened the old [Midland Terminal] railroad bed into a highway coming from Divide. They kept the tunnel and it was one-way. You had to wait at one end for the cars to go through. Some-times a car would get in a hurry and you would meet it half way and SOMEONE would have to back out. 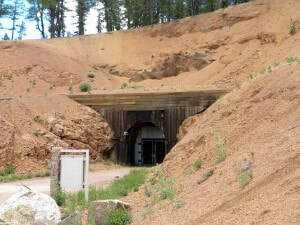 The old Midland Terminal Railroad Tunnel, which was adapted to serve as a one-way tunnel on Highway 67, is no longer used. 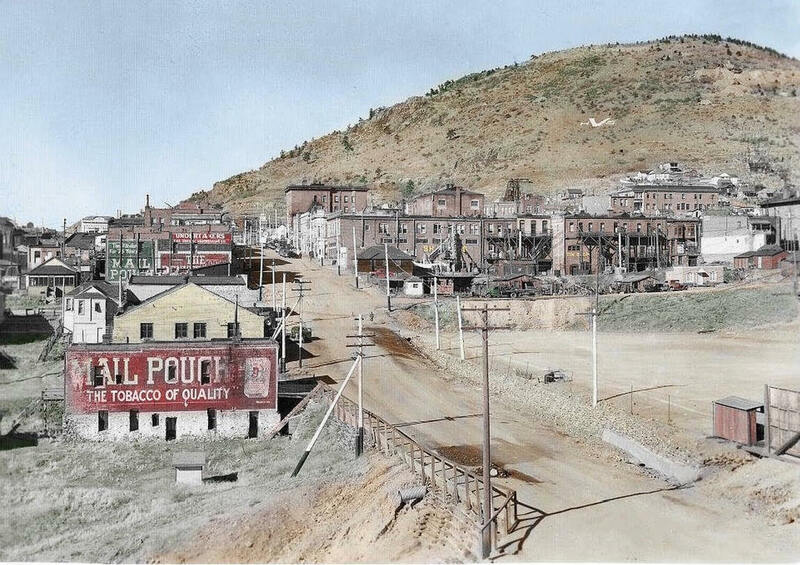 In 1994 a by-pass around the one-way tunnel was constructed to accommodate increased traffic resulting from legalization of casino gambling in Cripple Creek. Billboards east of City Hall. Historical Lehr photo from LaJean Greeson. In the late 1920’s Eleanor’s Uncle Percy Cartee and his Lease Friend, Fred Olson’s brother, had a good lease together. They went to Bison to celebrate. At that time they allowed boats at Bison. Their boat tipped and they drowned. Percy’s son, little Percy, was on the bank with his mother Adeline picnicking and he ran around the lake crying “daddy, daddy”. He was five at the time. This was the last time they allowed boats at Bison. The fire department was called to respond to that – it was at the Victor water property. Cusack owned a Billboard and Sign Company. The Cusaks lived in the estate on Ute Pass near Cascade. He owned all the Billboards. 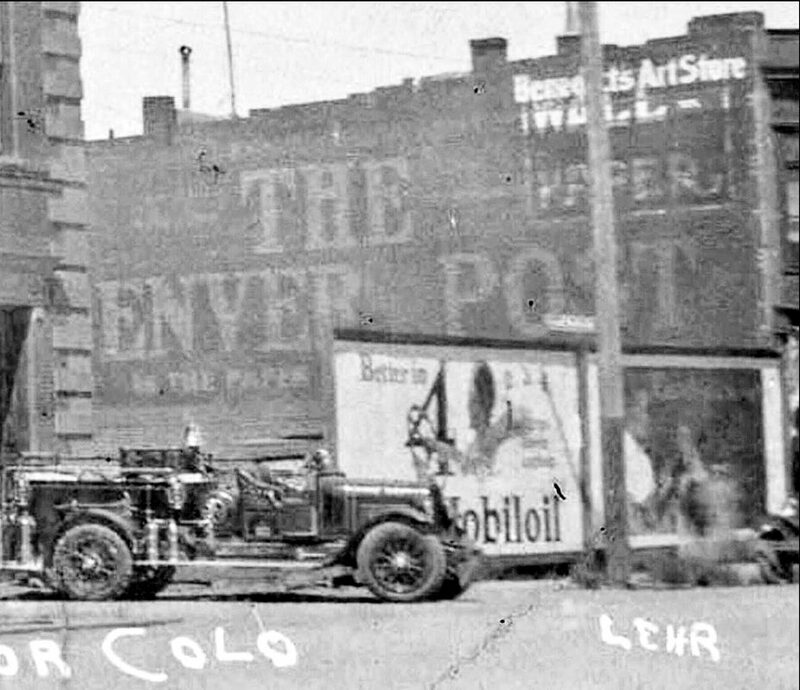 They owned a billboard on Third Street and also East of City hall was one of theirs. Young Percy Cartee ended up working for Cusack. He would go all around Victor, Cripple Creek and Colorado Springs and put up new billboard signs. His mother, Adeline (Eleanor’s aunt) worked in the Colorado Springs Antlers Café Pantry. James Burns, multi-millionaire developer of the Portland Mine, built the Burns Opera House in Colorado Springs in 1911-12. Many said it had the best acoustics west of the Mississippi. 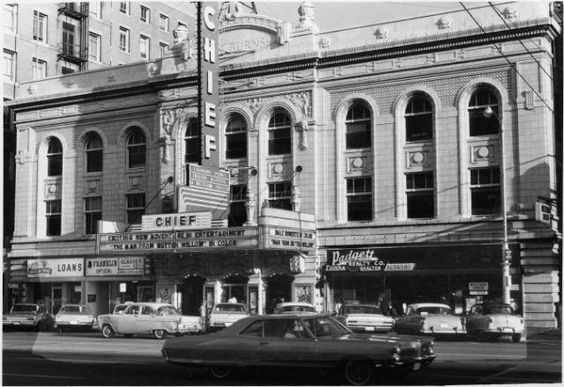 Chief Theater, 1965. 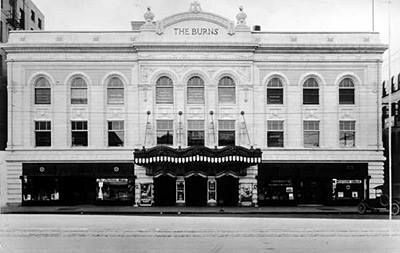 The Burns Opera House was converted to the Chief Movie Theater. Regrettably, it was torn down in 1973 after efforts to save the building failed. 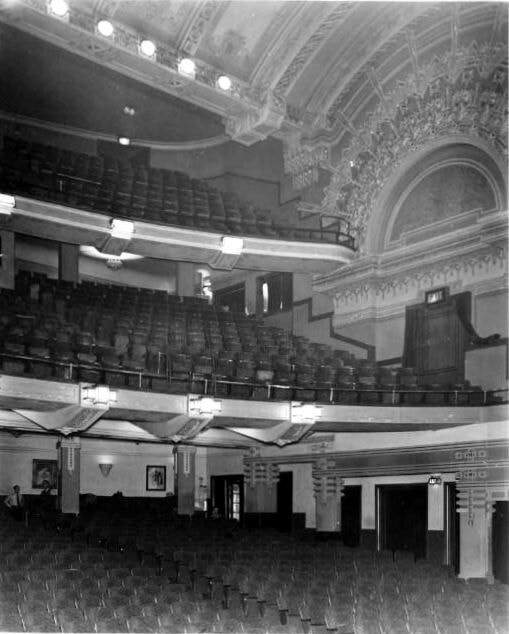 Ornate interior of Burns Theater seated 1,500. Eleanor recalled live vaudville & a grocery raffle. ​CLICK HERE FOR INSTALLLMENT #3 of this "Remember When" series recalled by Eleanor Baker and her mother, Sadie Musser.